Rhino tough courts for your backyard & commercial spaces. Rhino Sports® floors are ideal for competitive basketball, volleyball, racquet and other sports whether professional or recreational. Our suspended synthetic athletic flooring is used for indoor and outdoor gymnasiums, multi-purpose facilities, and special events. Rhino Hoops® offers a range of ultimate basketball systems that provide enjoyment and skill development to players of all levels, from junior players to the pros. Our products can accommodate the play of professional athletes, or add backyard fun and eye-popping appeal to residential schemes. Indoor or Outdoor, we have the tough court for you. Now you can play like the pros - with your very own basketball court in your backyard. There are no limits to the fun you and your family can have on your own custom basketball court or tennis court from Rhino Sports. We make custom courts to fit backyards, community centers or gyms, for indoor or outdoor use. Our innovative sports flooring system is resilient, durable and weather proof. The suspended floor design of our courts even includes a shock absorbing system that cushions joints and extends play time for athletes. You will take your game up a notch and hone your skills on your very own basketball court or tennis court. Our courts are also good for volleyball, roller hockey, badminton, aerobics, weight lifting and more. Whether you're looking for an indoor or outdoor basketball court or tennis court, a Rhino Sports®consultant can help you design the perfect court for your needs. We also carry top of the line court accessories including custom branded basketballs and tennis rackets for optimum play, rebouncer systems that keep the ball on the court, specialized hoop systems for training or honing your jump shot, and lighting systems that allow you to make the most of your playing time. Contact us today to get a one of a kind basketball or tennis court for your home, school, gym, fitness center or other commercial area! We build refined but durable courts. Our Pro Action suspended tennis court surface is designed to withstand heavy, regular use over the long term, with built-in flexion, making it the safest and healthiest tennis court surface in the world. It also delivers an excellent price to performance ratio. Our Pro Action courts are virtually maintenance free. Rain quickly drains through, no more sweeping or sponging. Just wait a few minutes, jump on and start playing. Our ten year limited warranty means trouble-free play. Rhino Sports® gym courts that are specially designed for the most comfortable play with the most reasonable prices. Rhino Sports®has gymnasium flooring, gym floors and gym courts that are specially designed for the most comfortable play with the most reasonable prices! Our amazing gymnasium flooring is low maintenance, low priced and comes in many different colors to make any gym court look great! Our floors our extremely durable and wear resistant so you can enjoy playing your favorite sports and games on them for years to come. Our gymnasium flooring is extremely versatile and can be used for multiple sports and activities including basketball, volleyball, badminton, tennis and more. Rhino Sports®gym floors are integral to helping absorb shock and lessen strains and fatigue injuries, as well as extending the playing time of your athletes. 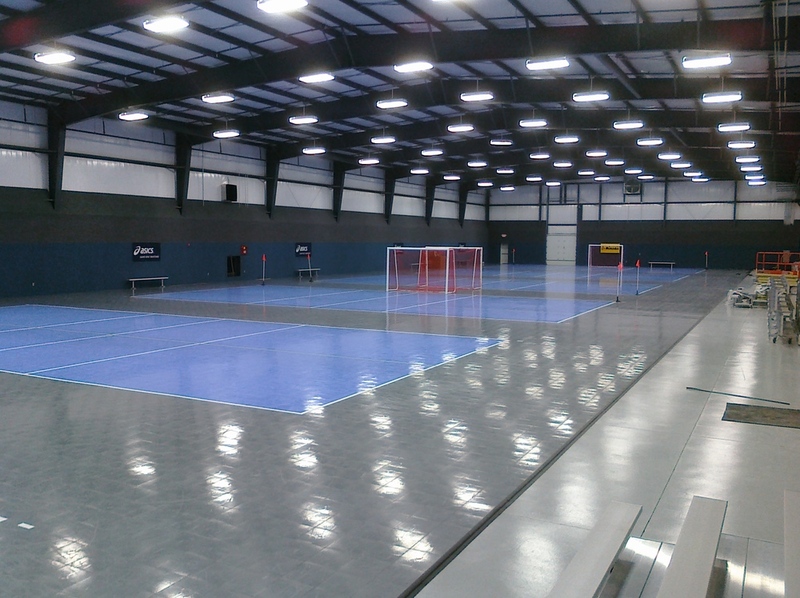 Our sports flooring is a great all weather alternative to traditional cement or asphalt courts. We offer durable gym courts and gym flooring that can be installed on indoor or outdoors sporting areas or courts for year round play. The materials that we use on our gym floors even help reduce high court temperatures during hot seasons. Check out our gym flooring and see why our sport flooring for gym floors and gym courts is superior to the rest. Rhino carries a wide range of game court accessories to support whatever game you're playing. From our custom branded basketballs to our unparalleled Pickle Ball rackets, Rhino Sports®has all of your accessories needs covered. Rhino Court lighting systems are hands down some of the best products on the market today. We can light up a single shooting court with our 1000w Metal Halide system or custom design a lighting package for your unique project. All of our light systems are protected using a galvanized coating and painted using the latest powder coating technology. Our basketball court accessories include custom branded basketballs for optimum play and rebouncer systems that keep the ball on the court, allowing you to make the most of your playing time. Our tennis court accessories include top of the line rackets and a variety of nets and net accessories to supply any level of play. Simply give us a call and we will be happy to match you up with the right net for your game. Our rebouncer systems keep your tennis balls inside the court and limit the amount of time you spend running after stray shots.